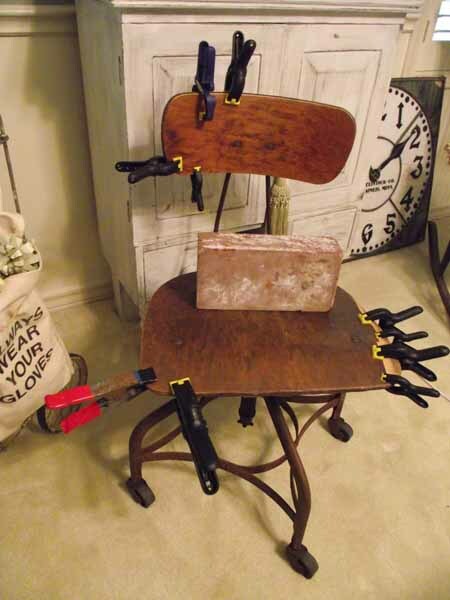 Fooled ya, :))))) No really I'm doing a little Chair Repair. You see the veneer on this chair was separating, I love the chair, it's so industrial schoolhouse chic. So out with the glue and the clamps and she'll be as good as gold. Next, I'll tackle this little beauty. She's doing some better, and thank you all for your advise, help, concern and prayers. Will keep you posted. And out flew something... It happened so fast I didn't even know what it was. I carefully returned the nest to it's place and left it alone. Mom did come back and she has been tending her nest quite nicely and today finally, I saw some little bird babies. I have no idea what kind of bird I'm dealing with. Mom is small, and has some rusty color on her. She's quick and leaves whenever I come near. I'll see if I can get a pic of her sometime as she feeds her babies. I love watching baby birds mature and look forward to sharing this one with you as I did the cardinals. 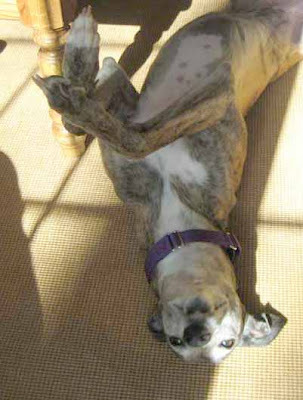 On another note, my beloved Greyhound Gigi is under the weather. The Vet has no idea what is wrong with her. Exam, blood work, and xrays show no problems. She is very lethargic and just lays around, very much not in her character. She recently had her yearly shots, heartworm preventative and flea treatment. I'm just wondering if it's a reaction to one of those. I'm very concerned for her. Please if you are one who prays for sick animals, please lift her up, she's too young to be leaving us just yet. Update: she appears to be feeling a bit better as of this afternoon. I hope she's on the mend. I just love old B&W photo's, Many old photo's are very very interesting, and it's fun to imagine what these people were like. Old Photos don't sell well, but I think that is because folks don't actually know what to do with them. First the Disclaimer, "I'm not a decorator I just play one on my blog"
In the example above, I've taken a wonderful wedding portrait and just propped it into a vignette in a basket. You often don't have to frame them. Many old pics are mounted on cards and prop right up on anything. The cream and sepia tones are perfect for today's monochromatic decorating. They work well with the "all white" decor or even a colorful Fall color palate. Put them at the back of a dark bookshelf, to lighten it up. The picture above has an actual family member in it. It's always fun if the pic is a family pic, but not necessary. Because my husband is very much into genealogy. I would suggest that if you are using pictures that are not family members that you mark them as such on the back. I also suggest that you mark all photo's on the back. Using a pencil is always good, or a post-it note. Instant relatives are what I've heard these old cabinet photo's referred to as. The one above rests in an old phone niche. It's also of family significance. They are great for Halloween, if you can find a particularly scary one. Many are scary because the subjects were not smiling, and were dressed somewhat macabre by today's standards. 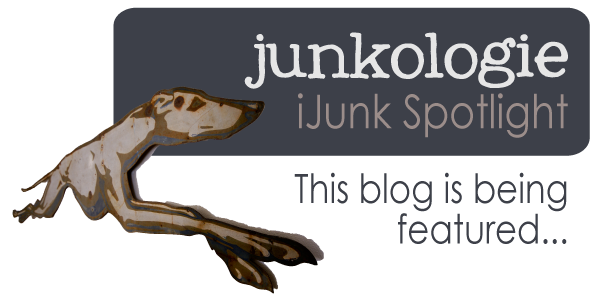 I first met Amy of Junkologie at the Junk Bonanza 2008 when she was just getting started. She shadowed the Red Shed Girls group for a research paper on the health benefits of flea marketing. We all wore pedometers and compared our miles walked for the day. And answered all her questions about what we thing might be the health benefits of this hobby. Now she's all over the Minnesota junking world, as well as being a professor at a Major University. Yes we loved calling her "Dr. Amy". Thank you Amy for bringing attention to my blog with your spotlight feature. Hop over, check it out and say Hi. Where Do You Find This Stuff????? That is the question I'm asked all the time. Where do you find all this stuff???? Well Let me tell you...You have to kiss a lot of frogs to find your Prince. This morning I found a Prince, at least in my mind. 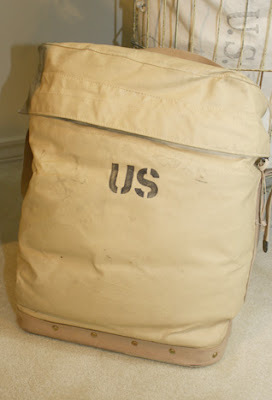 It appears to be fully insulated, has a wonderful carry strap, a perfect US on the side, a wooden bottom. What's it good for you ask???? 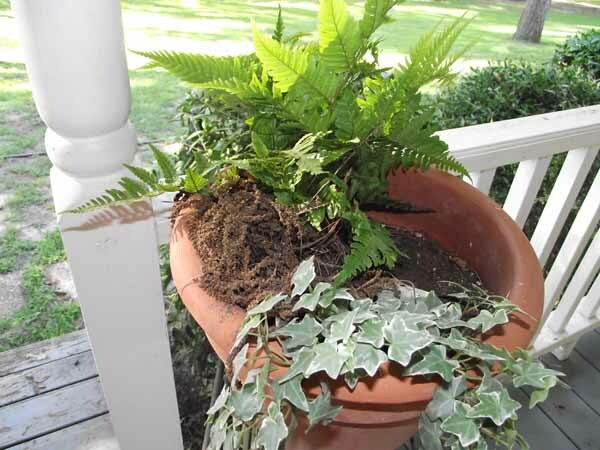 Well I'm thinking that a flower pot with a wonderful plant growing out the top would look great in it. It could also be good for transporting items that need to be kept cold. Who cares what it's good for, It's just fabulous on it's own!!!!! What would you do with it???? BTW, Where is everyone, traffic is up but comments are zero. I'm beginning to feel like I'm talking to myself. Update: Guess there has been a problem with blogger and the word verification process on comments. I've removed it so now you should be able to comment again. I'm glad it was a technical error, I was really wondering what was going on. Can't make it to Paris??? 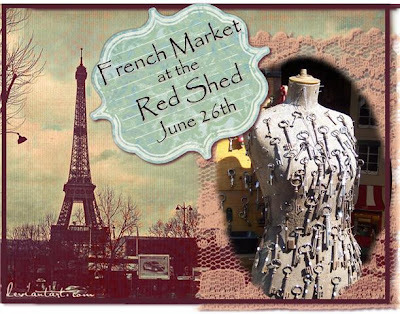 The Red Shed Girls in Grapevine Texas have you covered. This is the last item that I found in Arkansas. It's much cooler in person. 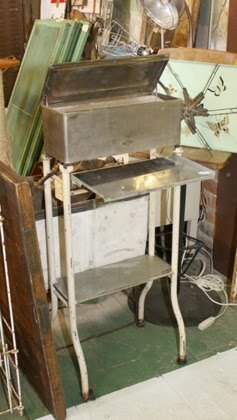 It's an old medical sterilizer on a great old medical stand. The sterilizer just lifts right off if you don't want it on there. It would be great for bathroom storage, towels etc. You can find this item and many of the others I've shown you from the past 2 posts, from my Arkansas Trip at Winnie & Tulula's in Athens Texas. I've shown you the retro fun from my Arkansas trip, now for the Junk. By far the best find here is the stainless steel medical stool on the right. 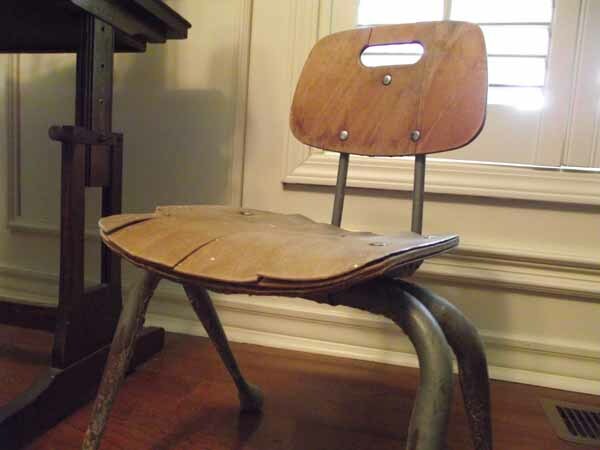 Sitting on top of it an old Potato Chips Can, Lots of drawers. The medium sized ones are actually metal fronts and cardboard cases. I've got 10 of those. Hard to see is the metal gate piece, and a metal drinks cart on wheels. Here's a close up of the metal/cardboard file drawers, and a great sled. The sled rails are actually a robins egg green, so wonderful. 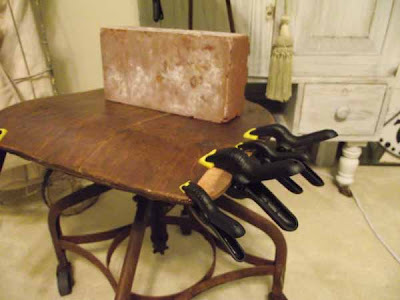 Needs a little repair though. I picked this old enamel table top up on Thursday, I love that it has rusted star shapes on it. Those are my junky finds, now off to clean, price and place. Oh and there is one more item that I'll show you later. It's by far the coolest piece of all. Mr Robot-o and I just got back from a mini trip to Arkansas. It was his idea to take a couple of days, drive north and see what we could find. We ended up in Bryant Arkansas and there we found this wonderful Antique Mall called Blue Suede Shoes. What a fun place. It seems that there were several dealers there that specialized in RETRO. As In "I grew up with that" Retro. As I entered one group of booths I was transported back in time to my childhood and Robot-o and I decided to camp it up a bit. I wish I could have played in this space, and rearranged it so it looked like the living room and kitchen I grew up in. But I thought the dealer might get a little peeved. So we just decided to sit at this retro table, grab a couple of retro glasses and pose for a shot. You see this is our 28th wedding anniversary. "What Channel is the Mary Tyler Moore Show on honey?" "Let me just tweek this AM radio dear and I'll see what the weather is going to be"
Wow where are my sun glasses? And we could have dressed the part too. There was a huge section of retro clothing right near the cash register. 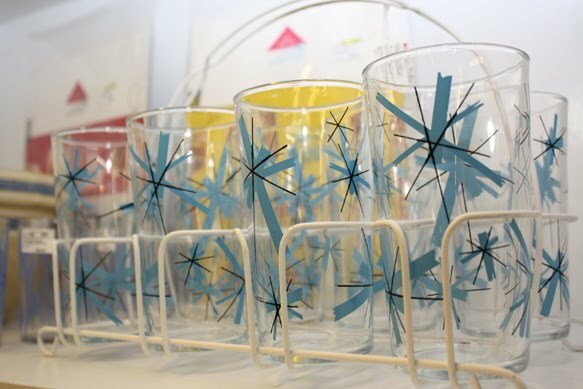 Lately I've fallen in love with retro glassware, but It's a bit pricey on Ebay. 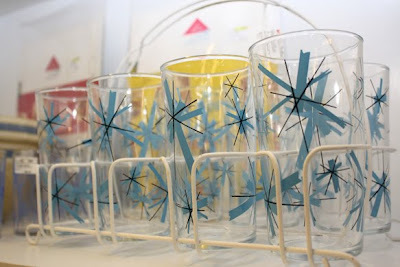 I was in luck at this place and came home with this load of great retro glasses. I did get lots of great junk too, but I just had to share this fun silliness with all of you. I know you are all chompin at the bit to see what I got at the Artifacts Sale in Palestine. Those are my treasures, what have you found this weekend? I had the privlidge of getting a preview tour of the Artifacts Sale in Palestine Texas today, and I must say that I was BLOWN AWAY!!!! There are lots of goodies for everyone. The first section as you walk into the warehouse is the newer stuff, Gift items, Candles etc. Then as you venture further and further back you find treasure after treasure of old stuff, and in quantity too. Dee sent me a few pictures to show you, but this does not do it justice.